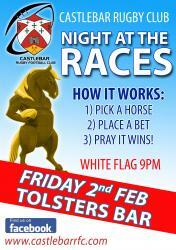 Congratulations to Brian Porter and all of the other winners of the Six Nations Predictions Competition. 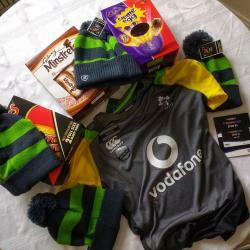 There are prizes for 1st, 2nd, and 3rd place; all of the round winners; and the best team name.First place prize is €200 and the other prizes can be seen in the main header. All of the winners can be seen in the list below; please contact one of the first team players to retrieve your prize:A noble effort by Ruari Hughes who is crowned with the Wooden Spoon Award for the next 12 months. 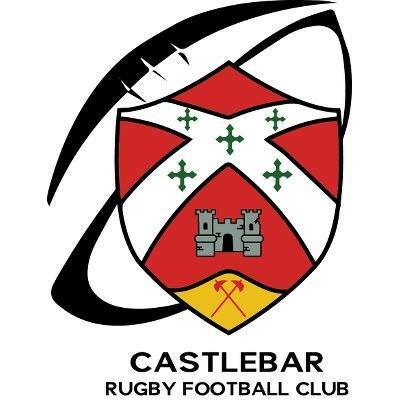 ..
Connacht Junior League 1B:Castlebar 17, Dunmore 11.Castlebar record back to back wins against Dunmore in a hard fought match with tries from Sean Tonra and Darragh King. This win has moved them up to second in the table 4 points behind Creggs in first.The next match for the men's team is Saturday the 2nd of December when they take on Creggs in Castlebar, kick-off 7:30pm.A big thanks to all support that turned out for the match! Saturday 11th:Connacht U16 A League Pool 2:Castlebar vs Creggs, in Creggs, Kick-off 1pmSunday 12th:Connacht J1B League:Castlebar vs Dunmore, in Dunmore, Kick-off 2:30pmSupport for all games is greatly appreciated! Friday 3rd:Connacht U18.5 League:Castlebar v Buccanneers, kick-off 7pm in Castlebar.Connacht Women's League:Castlebar Ladies vs Tuam, in Castlebar, Kick-off 8:15pmSaturday 4th:Connacht U16 A League:Castlebar vs Ballina, in Castlebar, Kick-off 2:30pmConnacht U13 A League:Castlebar vs Corinthians, in Galway, Kick-off 4:30pmSunday 5th:Connacht Junior League 1B:Castlebar vs Corrib, in Corrib, Kick-off 2:30pmSupport for all Games is greatly appreciated!! Connacht Women's League:Castlebar 58, Galwegians 2nds 5.Fantastic win to open the ladies league campaign with tries from Emma Doyle (3), Anne Marie O'Hora (2), Lisa Carroll, Emma Fabby, Ursula Sammon, Claire O'Brien and Sandra Kenny.Their next league game will be at home on Sunday November 5th at 1pm against Tuam.Connacht Junior League 1B:Castlebar 14, Tuam 7A hard fought win in tough conditions with 1 try from Mark Staunton and 3 penalties from Ronan Conway! Man of the match goes to..
Castlebar Ladies start their League campaign with a home game against Galwegians 2nds this evening @ 8pm, all support appreciated! Tonight;Connacht Women’s League;Castlebar vs Galwegians, in Castlebar, Kickoff 8pmSaturday 21st;Connacht Junior League 1B;Castlebar vs Tuam, in Castlebar, Kickoff 8pmSunday 22nd;U18.5 A League;Castlebar vs Corinthians, in Galway, Kickoff 12:30pmU16 A League Pool 1;Castlebar vs Creggs, in Creggs, Kickoff 1:30pmSupport for all matches is greatly appreciated!! Friday 13thConnacht Junior League 1B:Castlebar vs NUIG, in Castlebar, Kick-off 8pmSaturday 14th:Connacht U13 A League:Castlebar vs Monivea, in Castlebar, Kick-off 1:30pmConnacht U15 A League Pool 1:Castlebar vs Creggs, in Castlebar, Kick-off 2:30pmConnacht U18.5 A League:Castlebar vs Oughterard, in Castlebar, Kick-off 6pmSupport for all games over the weekend is greatly appreciated! !